Wondering what to get the blogger in your life for Christmas? Check out these suggestions! One of the things I'm most grateful for this year was my discovery of my love of blogging. Many of my family members have asked what they can get me for Christmas to support my new found passion - I thought I'd collect a few ideas for my fellow bloggers, to save us all some time! (Be sure to subtly check with your blogger on the subscriptions - wouldn't want to pay for the same thing twice!) Happy Holidays! 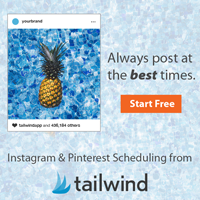 Tailwind is a service that allows bloggers to schedule pins and Instagram posts - this serves two purposes. First, it allows us to post at the best optimal times, which can impact how a post will perform in the future. Second, it allows us to escape the computer every now and then! I schedule Pinterest posts in advance, and then Tailwind pushes them out over the next weeks. Tailwind has had the most impact on my blog view of all the different apps and sites I've tried! Especially for those of us who have full-time jobs in front of a computer, in addition to blogging, the amount of time in front of a computer can start to wear on the eyes. I wear these eye strain glasses to cut my eyes some slack! They have just the slightest yellow tint, but actually fit well and look quite normal. Many new computers no longer have USB ports to attach the old style cord mice - using the finger pad without a mouse for long periods can lead to muscle fatigue on thumbs. Wireless mouses are a cheap and easy solution! One of the things I enjoy most about blogging is listening to audibooks while blogging - especially while doing some of the more mundane pieces that can get a bit dull. Of course you can't read a book while using your hands to blog, and sometimes it's nice to learn, rather than just watch TV! Audible is a great service - you can easily download the books onto a phone and listen at home, at work, or in the car! Happy Holidays, thanks for stopping by, and keep blogging!